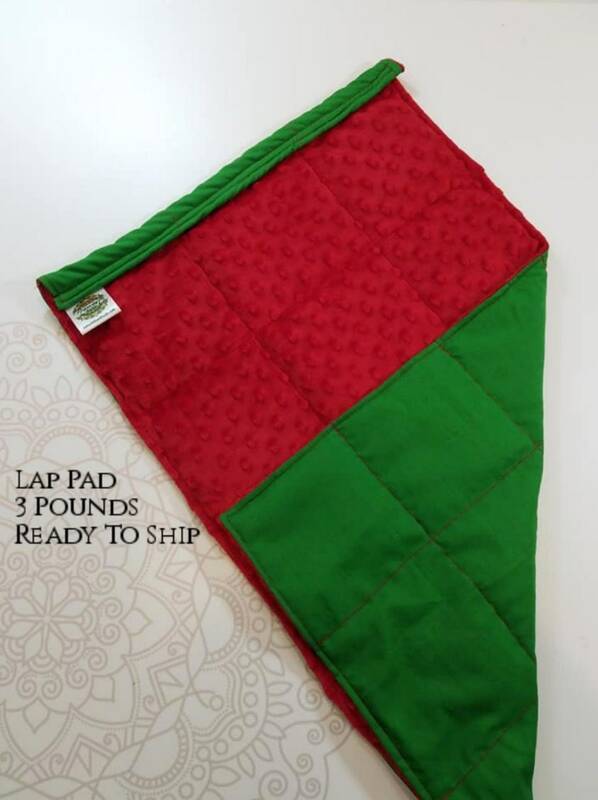 Made from green woven cotton and backed with a coordinating red minky fabric for added softness and texture. This is a sensory weighted blanket. The blanket comes in 3 pounds and measures 14x22 inches. This is a great size for a toddler or older child. The blanket is reinforced around all the sides and the weight inside the blanket is evenly spread and unable to gather in just one area. If you do NOT agree to the terms and conditions of this purchase, but still follow through with your purchase, your transaction will be canceled. Thank you for understanding. Please know that our #1 goal is to keep everyone, especially your children SAFE and HAPPY. You agree that jurisdiction over and venue in any legal proceeding directly or indirectly arising out of or relating to this purchase (including but not limited to the purchase of NamasteHandMade products) shall be in the state or federal courts located in the owners home county and state. Any cause of action or claim you may have with respect to this purchase (including but not limited to the purchase of HamasteHandMade products) must be commenced within one (1) year after the claim or cause of action arises. NamasteHandMade's failure to insist upon or enforce strict performance of any provision of these terms and conditions shall not be construed as a waiver of any provision or right. Neither the course of conduct between the parties nor trade practice shall act to modify any of these terms and conditions. NamasteHandMade may assign its rights and duties under this Agreement to any party at any time without notice to you.